Mo Crow created this beautiful Stole of Bandaged Hearts and I am so privileged to be a part of it. 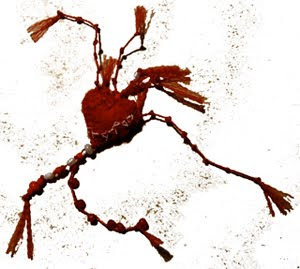 We met through our blogs and last month she sent me an image of a "bandaged heart"
You can read Mo's post about the stole at It's Crow Time and view more of Mo's work at Blue Cat Heaven. Thank you for letting your heart stay here with the gang on the stole!